To understand logic behind those designs, You have to come back to the end of Great War. In 1919 started committee to investigate if battleship, as a kind of ship, is something that Royal Navy needed. There were some sounds, that battleship is dead. Future weapons will be light forces, submarines, planes and so one. Committee investigated many proposals – including some strange ideas as “explosive remote controlled motorboat”, “remote controlled airplane full of explosives” and so one. Committee ended in March 1920. Conclusion was, that battleship, as a strongest ship of the fleet is still needed. Of course she will not act alone. It will be part of the larger force, and battleship – or better to say – battleships will be strongest part of that force. Against enemy with such a force anything else could not guarantee success. Battlecruisers were considered as needed only optionally. If enemy will have battlecruisers, British will need own. If enemy will not have battlecruisers, that class of the ships could be omitted. It was stated, that thanks to its great size, and cost, battlecruiser is a “capital ship”. Yes “capital ship” term was used before WNT. 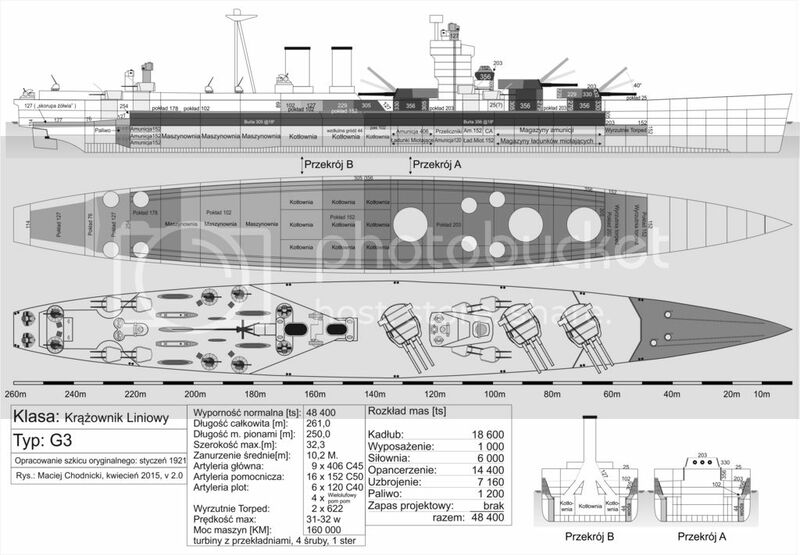 So such a costly ship had to have battleship level of protection, and battleship armament. Higher speed was to be attained by greater size. In other words battlecruiser was to be simply fast battleship. In this therm – WWII era American South Dakota class was a battleship, and Iowa was battlecruiser version of South Dakota. Committee ended even with recommendation, how new battleship should look like. I never seen any drawings, but description is quite precise. It is quite easy to imagine her. It was just Bismarck. 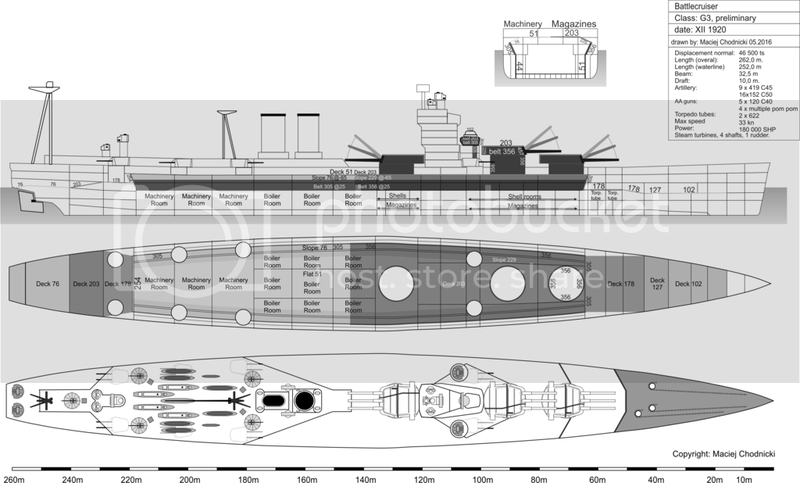 Yes – in 1919 British ideal battleship was a bit smaller Bismarck. I don’t know if Germans had access to that committee conclusions, but Bismarck seems to be point to point realization of that battleship conception, only with 25 knots and smaller size. Every other difference due to different navy and local habit. Even three shaft machinery was recommended. Main armament – 8x15” C50 gun. New model with high muzzle velocity, expected to have nearly identical penetrating power as US 16” Mk I guns ( if fired the same quality shells ). No AA artillery was specified, and soon new committee about such a guns were started. The only important conclusion of that committee was that battleships were needed in the fleet. In 1919/1920 building new battleships become more and more urgent. British had strongest battleship force in the world, but most of them were quite old. 12” were obsolescent, and 13.5” nearly so. In case of new ships, Hood was just completed, and her sisters suspended on very early stage of construction, soon canceled. There were no new orders, and Japan and USA started new construction program. In USA – Colorados, South Dakotas and Lexingtons were started, or were to be started soon. In Japan new ships were started. 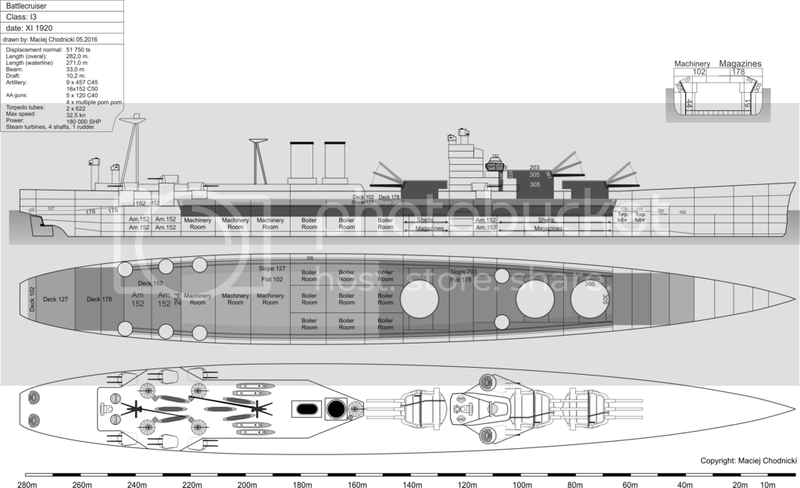 British knew virtually everything about US ships, but had little knowledge about Japan construction, but expected that Japan will start some kind of upgraded Queen Elizabeth and/or Hood, not virtually not armoured, very fast battlecruisers and slow battleships. After finishing those ships, it was expected that Royal Navy become second or possible even third world power ( in battleships at last ), and it was unacceptable. At first it was conception of starting 3 battleships and 1 battlecruiser in 1920/21 year budget, and 3 battlecrusiers and 1 battleship year later. Soon it was changed to 4 battlecruisers first, and 4 battleships next year. It was start point of real development of new ships, ended with G3/N3 designs. So new committee started to decide how new battleship and battlecruiser should look like. 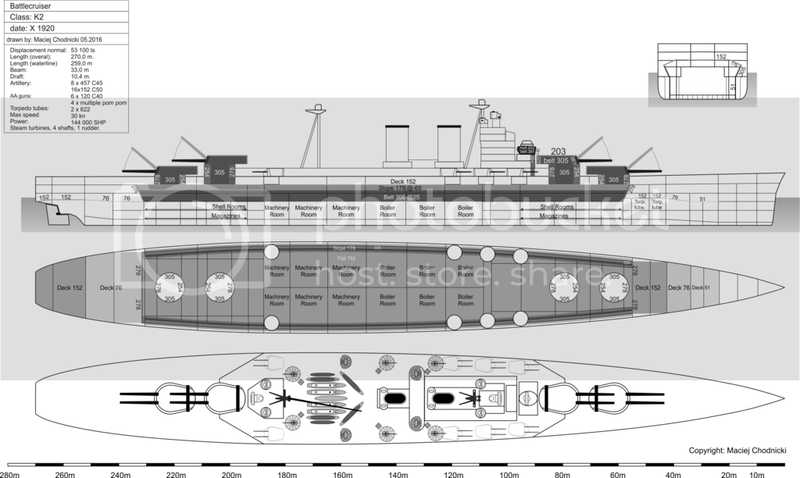 Even before committee started in May 1920 two battleship designs were prepared. Both with 18” guns, and armour enough against such a shells. They were named LII and LIII. LII with twin turrets, and LIII with triple. Speed were more or less the same as in “battleship 1919” - 25 to 26 knots. Armour was on different principle. Conception of multilayer protection was abandoned. New shells become so strong, that allowing them to reach hull, and explode inside, was considered not good idea ( as we remember in “Bismarck scheme”, some AP shells were expected to penetrate external belt/deck and detonate inside over main armour deck. Exact the same principle was in armour conception of battleship 1919, and all previous British battleships since Majestic ). Any detonation of such a shell inside hull will make considerable damage, even if contained above armour deck. It simply could not be ignored, so it was decided to keep shells out of the hull. To keep out such a shells, armour had to be very thick, and that alone was not enough. It was real need to slope it to add resistance, as new AP shells become better and better. Those first two designs were some sort of initiative outside any committee, but was basic for further development, so are interesting. First thing – abandoned armour coning tower! Yes those ships were designed with no armour in that area. Another interesting thing – all turrets on the same level – as in some Russian designs. Forward arcs were blocked with small elevation ( less than 12 degree ), but in longer ranges not. Possibly that was try to keep center of gravity down with such a heavy guns/armour and very high free board. Armour is interesting, specially very strong deck armour. Belt was internal, with bulges. I don’t know reason of such strange “cut” in the belt similar to American’s WWII South Dakota. Try to force flash from torpedo explosion in that place? Oil intakes? Twin turrets were considered better from any practical point of view, I think it is no need to explain why, but generated larger ship. Nearly 1000 tons larger, with 1 knot less speed, with the same armour. So triple turrets makes considerable weight economy. Rest of armament as in committee, less AA guns. AA committee were just started, to it was not decided which, and how many AA guns had to be mounted. You welcome. As I see some interest, I put part two. Before I put any new drawing, some long, boring text is needed, to fully understand logic behind those drawings. As soon as was decided that new battleships were needed, there were need to decide how they should look like. Design was to be started from zero. New ships had to incorporate all war lessons, and there was long gap in construction of British heavy ships. Newest was Hood, considered too weak in every aspect to face enemies designed that time in USA and Japan. It was known that there will be many designs, so to simplify process, battleships and battlecruisers received letters with digit described numbers of guns in main battery turrets. Battleships started from L to later letters in alphabet, so next designs were M,N and so one. Battlecruisers from K, to forward part of alphabet, so next designs were K, J, I and so one. Digits were changed from roman to arabic style, so instead of LII, now we have L2, and it is quite different design, only with some very early connection to older one. Basic requirement, was that new ships had to be able to use existing infrastructure. Can be build in existing sleeps, can be docked in existing docks, can use existing harbours, and be able to transit through Sues and Panama channels. Co basically external dimensions were to be no larger, or just slightee larger than Hood. First general requirements were set. Overall need of protection, artillery, speed, endurance and so one. Implementation of those ideas were to be done later. AA guns were not set. Other committee was started to work only about protection against planes. It worked parallel to committee of designs of ships, but there were exchange of information about conceptions, that newest thinking about AA guns could be implemented in new ship designs, even if AA committee was not finished its work. Max speed of battleships was set as in conclusions of 1919 committee. 25 knots. Possible reduction to 23 if absolutely necessity. Battlecruisers had to be not slower than Lexintons expected to be capable of 33.25 knots. Range 7000 miles @16 knots. Existing 15” gun was considered too weak. Was good against existing battleships, but it was known that in USA and Japan new ships will have stronger guns. So something better was needed. Existing 18” gun was quite good, but a bit too short, so muzzle velocity was not impressive. And single turrets were unacceptable. New turrets had to be designed anyway, so design of new gun changes little. And it was requirement, that new battleship must be able to defeat armour of enemy with 15” belts and 7” deck in expecting battle ranges. Existing guns were considered too weak to accomplish it. New gun was required. It was only one obvious choice. Only a half a year before, 15” C50 was considered ideal weapon. Good penetration, relative low weight, even logistically superb, as will fire the same shells, only with stronger charge. 6 months later situation seems to be much different. New ships have to face not existing enemy, but enemy which are designed, or could be soon. British knew that Americans had new more powerful 16” gun, and will mount them on South Dakotas and Lexingtons. More important they are working on prototype of 18” guns, and there were rumors of starting design of 20” gun. 20” was far from realization, but 18” was so advanced, that follow South Dakota could be armed witch such a guns. It was expected that Japan will soon have even 19” guns. 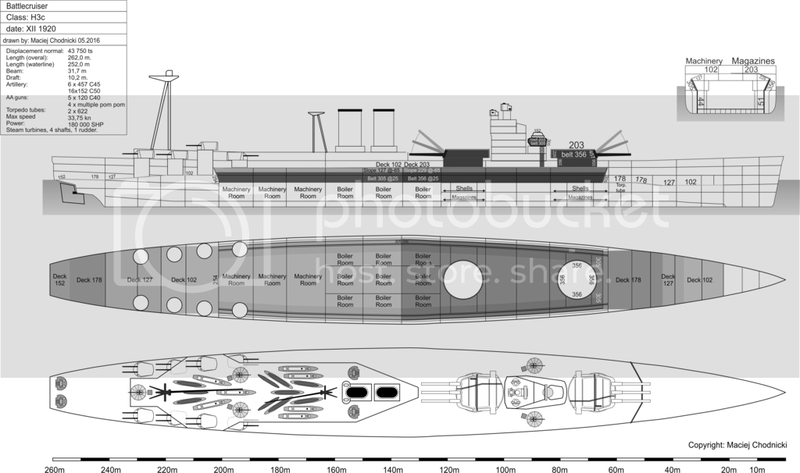 Considering all those, 18” gun was the only option, if new British battleships were to be armed not worse than enemy. As usual, 4 twin turrets with disposition as in QE was considered ideal configuration. But it was known, that 3 triple turrets will make considerable reduction in weight, so 2 versions of any battleship/battlecruiser were to be investigated, with both numbers of guns. Secondary guns – as in 1919 committee. 16x6” guns, new model, in 8 twin turrets. Disposition in 4 corners of rectangle. For some time 5.5” guns were considered, as faster firing weapons, but they were ruled out. Guns had to be mounted in turrets with some splinter protection. Casamattes or open mounts were not allowed. Turrets had to be mechanized extensively, so practical difference in rate of fire between 5.5” and 6” gun, was expected to be marginal. And 6” guns had stronger stopping power. AA guns ( different committee, but with close cooperation ). 3” soon was abandoned, as too weak. 5.5” soon later. At first it seems to be great, as makes opportunity to make universal battery. Yes universal in 1920. But AA guns were needed to be fast moving, and fast firing. And to be mounted on open mounts for many reasons. Anti destroyer guns were to be mounted in turrets. There were so different needs in HA and LA guns, that conclusion was that “universal” gun for everything probably will be for nothing. In pure AA role 5.5” was too heavy to give enough rate of fire, so it was end of that gun. Than it was choose between 4” and 4.7”. After some study 4.7” was considered much superior, and that gun was used. There were need to be 5 or 6 such a guns on ship, in such disposition that at last 4 of them be able to fire at any point in the sky. There were no drawings how to place them to make it work, so as we know that capability of firing 4 guns in any part of the sky was not accomplished in any of the designs. Those guns were to be controlled by central fire control, with director high in the ship in such a position to have clear view in any part of the sky, not blocked by anything. 4 multiple pom poms in 4 corners of the rectangle in such a positions that in most sectors at last 2 of them can fire, and everywhere at last one. Each of mount to be controlled by director placed in such a place to be clear of blast of any artillery, with good area of vision. “multiple” at first means anything between 6 and 10 barrels, with strong preference to 10 guns. On mount it was need to have store ammo for 2 minutes of fire with no external supply. As we know, mounts were done much later, with 8 barrels and ~1.5 minutes of continous fire. It was some opposition to torpedos, but finally were used. 2 tubes of new caliber 622 mm, one on each belt, submerged. It is good to remember, that 15” shells fired from new more powerful gun, with expected penetration power as US 16” C45 gun, so easy could 16” guns could be put there, but not most modern one. 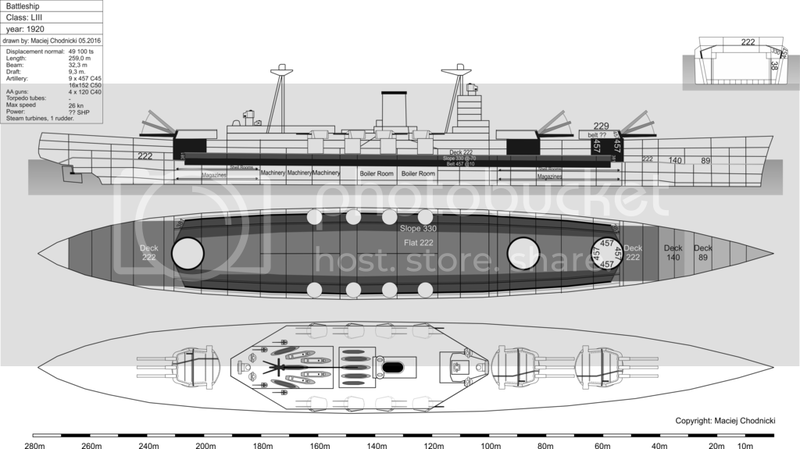 Very early approximation stated that battleship armoured in variant 2, will be ~5000 tons larger, and 1 knot slower, compared to weakest armoured version. Best protected ship will be 7000 tons larger and 2 knots slower than smallest ship ( if rest are the same ). Only 2000 tons difference in protection of machinery seems strange compared to 5000 tons protection of magazines, but only at first. Magazines needed full safety even in inclination to enemy, so some extra armour was needed over machinery anyway to protect against racked fire. And as we can see in LII and LIII, magazines were much longer than machinery spaces, so area needed to be covered by armour over magazines was mach longer. 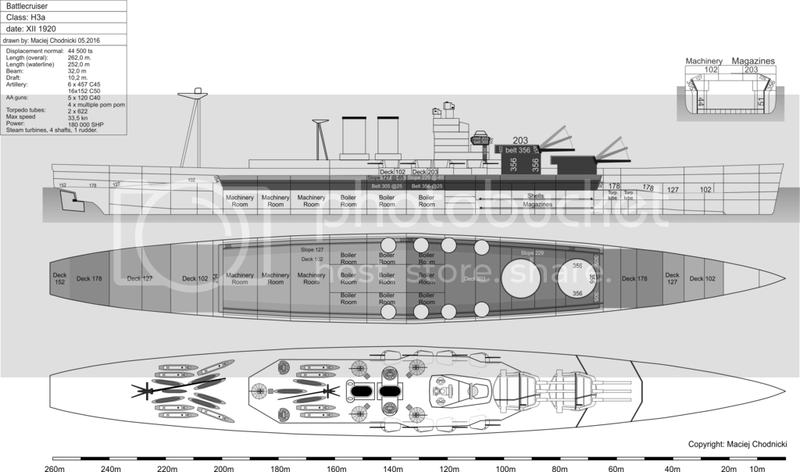 In battleships of course, battlecruisers, with larger machinery spaces, were different story. 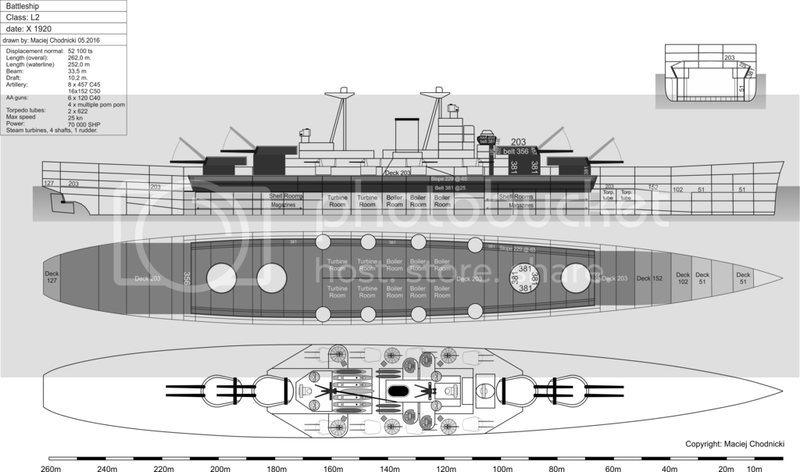 Conclusions was that battleships had to be protected in scheme 1 ( full protection against 18” fire ), and if it will be impossible for weight/size reasons, scheme 2 ( machinery only against 15” guns ) could be accepted. It was obvious from begin, that battlecruisers could not be fully protected against 18” fire, so scheme 2 should be implemented. If impossible, scheme 3 ( full protection against 15” guns ) could be accepted. To allow protection against 18” fire, very thick belt would be required. To save weight, and allow making plates thinner ( and with more optimal thickness to allow better quality ), belts were to be mounted internally, sharply sloped 25 degrees to vertical. Now there was big come back of that scheme, used by Americans in Nevada and later. Yes I’m so heretic that I will state, that Nevada was not first witch such a scheme. AoN ( not named that, but with exactly that principle and similar realization ) was widely used in XIX century. Now it was more new version, but still the same principle – full protection against enemy heavy AP shells, in cost of protection against smaller and HE shells. To protect against contact detonation of 750 lbs of TNT. 1000 lbs were considered, but ruled out as generating too large ships. Double bottom 7 feet high, to give some protection against underwater detonations. If not possible for weight reason, reduction to 5 feet was allowed, with stronger construction. That bottom should contain, or at last limit effect of under the keel detonation of something like 300 lbs TNT. Protection against larger charges was considered impractical at best. Now it is time to start about specific designs. After setting basic requirements, it was start to make specific designs. General comment. All drawings are mine, based on limited sources, and very primitive “original” drawings. 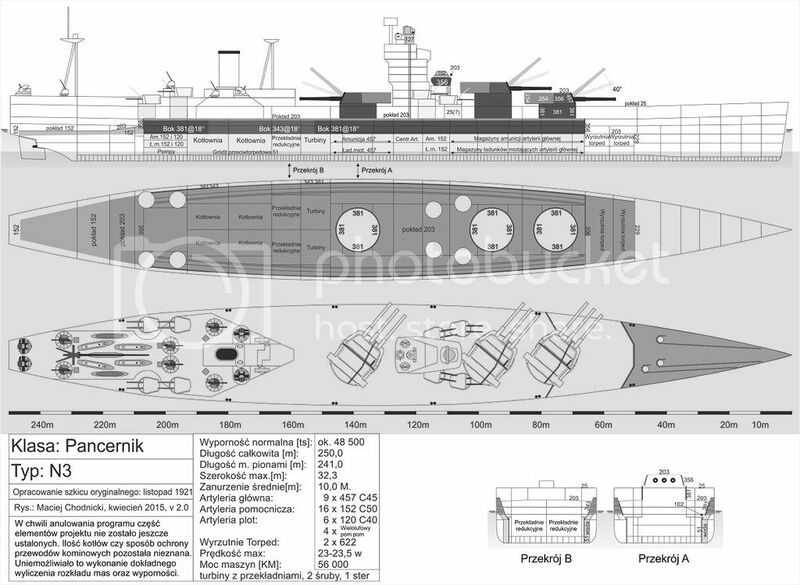 Disposition of bulkheads, and disposition of artillery and internal layout should be more or less correct, and plate thickness and dimensions too. But exact shapes of hull – not. There will be “transform stern” for example, but how large? What exact shape of after part of the hull? Not 100% accurate. Armour – in all drawings with the same principle. 18” and thicker – 100% black. 0” thickness – 0% black, rest proportional, so 9” is 50% black, 12” - 67% black and so one. Thinest plates, say under 2” are in black, as very light gray is simply invisible. Generally there was no many designs and one taken to realization. Actual conceptions were incorporated to actual design. After reworking of design, if was not accepted, was thrown away, and next design ( with new letter ) were prepared. So there were no such a thing as “choose between K,I,J,G” but older scrapped, and new prepared. If design with new letter was started it means ( one exception ) that older was trown away. At first battleships and battlecruisers were designed at the same time, as at first it was expected that both classes will be started at the same time, so both designs were needed at once. Battleships were L2 and L3, battlecruisers K2 and K3. All in October 1920. Adding all committee requirements were problematic. It needed increase in size, specially length. They become so long that could not be docked in existing infrastructure. Somewhere in early 1920 it started conception that “classical” stern is useless. Why not cut some meters of aft part of the ship? At first about 10 meters ( 30 feet ) after rudders, than distance between rudders and “cut” was reduced to 15 feet, finally just after the rudders. In Marc 1920 first test of such a shape was tested. It was a bit surprised, even shortest “most extreme” example gives only slight increase in resistance, compared to longer hull. With so promising results, next series of tests with various hull shapes were started, and that time it was decided to incorporate such a stern into new ships. After extremely numerous tests, hull shape was find with less resistance to water in high speed ( so some speed was gained compared to classical hull of the same length ), in cost of increase of resistance in medium/low speed. So cost of exploatation of ships will increase due to higher fuel consumption in economic speed, and range will be smaller, but range in high speed will increase and max speed too. Nearly all ( except one, described later ) new designs incorporated that tarnsform stern. All were designed with 1200 tons of fuel in “normal displacement” and 5000 tons fuel in full load displacement, doesn’t matter about power of machinery. It is good to remember, that all were very preliminary designs, so exact capacity of oil fuel could be decided later. At first all designs were started with smaller possible dimensions. It was more easy to put something and increase displacement, than mass savings. Ks and Ls were a bit too large. Its lenght limited docking capability in Rosyth and Portsmouth to only largest dock there. Forcing through Sues canal was possible only with total empty ship. Armour of L2 and L3 was good against 18” shells. Belt was thinner, compared to LII and LIII, but inclined at 25 degree, so should have similar protection. Deck (flat) was 8” thick. It was considered minimum thickness to protect against 18” shells at long range. Deck was considered sufficient to protect citadel. For British it was essential to protect deck forward and back of citadel just under the waterline. Idea was simple – if detonation is over water, effect will be contained over, so some buoyancy were to be keep, and loss of speed minimal. If under water – again, damage will be limited. L3 thanks to triple turrets was 1000 tons lighter. Citadel was simply shorter. Ks were longer than Ls, but K2 and K3 with the same external dimensions. This time K3 was 1100 tons lighter than K2 for the same reason. Savings were considerable, so all later ( except one conception with no hope of realization ) were with triple turrets. K had the same machinery as Hood ( at last in power ). Result was ship with max speed ~30 knots. With limited dimensions, it was impossible to keep armour on battleship scale. Even “level 2” protection ( 18” magazines and 15” machinery ) was impossible, so she was protected only against 15” shells in whole citadel. K3 were taken for more investigation. Hull shape was changed, to gain ~0.5 knots of extra speed, but resulted longer hull. Soon width was 35 meters, so it was impossible to put into panama canal. Displacement 52800 tons. After some considerations it was decided to scrap those designs. All were too large. Armour on battleships was too short, on battlecruisers too thin. Battlecruisers with 30 knots were too slow. Still speed 33+ knots was considered essential, to keep with Lexingtons. That time it become clear, that battlecruisers will be started first, and battleships later, so battlecruiser design was more urgent, and clearly more difficult to be done. Now battlecruisers become more important, as were needed first. Ks were too large and too weak in very aspect, except artillery. Next design J3 ( only one with triple turrets ). It was desperate try to keep size of ships down. This one in unique in many aspects compared to other of the period – and most “conservative” one. It was basically reworked Hood. Artillery changed to 9x15” C50 guns. New model, recommended by 1919 committee, but in triple turrets. Deck armour reduced by half, compared to Ks. Belt mounted externally ( the only design with such belt ). No slopes of deck above it. Not flush deck, but hull reduced one deck height aft, like in Hood. Machinery the same as Hood. Slight upgraded only. 151 000 SHP was power developed by Hood on trials. With all those things, she was 9-10 000 tons lighter than K. Size like Hood, so could use all “Hood’s” infrastructure and so one. No one was happy with it. Still 1 – 1.5 knot slower than Lexington. Guns good against existing ships, but problematic if had to kill battleship with 15” belt and 7” deck ( basic requirement ). Armour “only” against 15” shells. Other problems minimal compared to those. So she was scrapped and new design prepared. radical departure from existing practice. In “classical” configuration, turrets are forward and aft of ship, and engines in the middle. It has its advantages, but disadvantages too. It push magazines in shallow part of the hull. Specially it is important in battlecruisers with very fine hull lines for high speed. With need of some volume, magazines had to be very long. As a result citadel long ( with of deck had to be large to protect hull anyway ). Too long magazine is not so practical, so SPS protection is compromise, as had to be shallower. Specially it is visible in after part of the hull where out of shafts are to be stored in the same area as magazines, turret machinery and so one. As a result whole protection is severely compromised, and we know that by definition “compromise is a solution with which everyone is unhappy”. Detonation of magazines due to torpedo, was quite possible, and as a result, area which needed best protection, had weakest protection, due to hull shape. Idea was to put magazines in widest part of the ship. They could be short, but with full width, and full depth of SPS. Automatically design of after part of the ship was more simple – no need to avoid whole things of after turrets. Even stress on ship will be minimalized, as very heavy turrets/barbettes/supportiong structures/ammo were far away from bow/aft. And better sea keeping was expected. Nothing for free – in that configuration some sector aft was bind to main artillery. But that was considered acceptable, specially with special shape of superstructures to make such a “blank area” as small as possible. Result of that conception was I3. Longest of all designs, but not largest in therm of displacement. 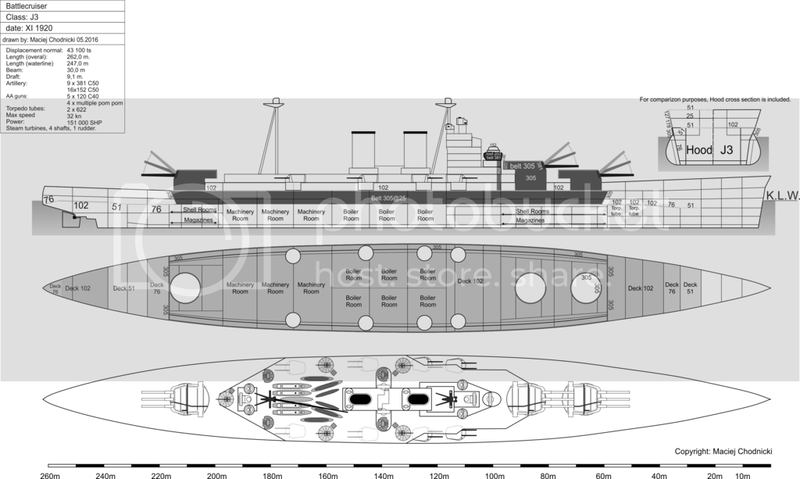 Compared to K3, she was 250 tons smaller ( say the same displacement ), had the same artillery, 2 knots more speed, and thicker deck over magazines ( but thinner over machinery ). Barbettes with the same thickness all around. More than 180 000 SHP was impossible, due to technology limitations at the time on 4 shafts. More than 4 shafts were not even considered. She was nearly good in every aspect, but too large to be accepted. Whole thing is translated shortcut of my very first article for Polish periodic. Unfortunally when I look at those my old drawings, I simply can’t show them, as they are too primitive. So I not only translate those pictures, but upgrade them before publishing. It takes time. I3 was fine, but too large. Weight savings was required. First, simplest way, was to delete one main battery turret. This alone ( turret + ammo ) generated ~2 500 tons of savings. Next were thanks to delete barbette, shorter citadel and so one. As a result ships were ~6000 tons lighter compared to I3. The same machinery was retained. Deck over magazines was as in battleships. Belt 1” thinner than on battleships but 2” more than on I3. So armour over machinery was a bit strange. A bit to weak against 18” shells ( belt ) but too strong against 15” (long barrel) or 16” (short barrel) guns. But capable of resisting new US 16” C50 guns, and possible Japan 17” - 17.5”. It was expected that Japan could have such a guns. There were 3 versions. H3a, two turrets forward. H3b, one forward and one in the middle, in higher position, H3c as H3b but one deck lower. All had its advantages and disadvantages. H3b had highest center of gravity, so to keep stability, she had to have highest beam. It resulted largest displacement, and slowest speed ~33.25 knots. But placement turrets such high, resulted possibility of firing guns in extreme weather. And give opportunity to put one pair of 6” turrets forward, for good separation of secondary guns. H3c had lowest center of gravity, so could have smallest beam, and had smallest displacement. Result 33.75 knots max speed, highest of all three, but secondary guns all had to be in after part of the ship. H3a was in the middle in center of gravity, displacement, beam, and speed 33.5 knots. But could fire all turrets forward. At first they seems to be OK. Artillery 18” guns, armour nearly in level 2 ( magazines against 18” guns, machinery against 15” shells ), speed no less than Lexington. Most important was artillery of only 6 guns in only 2 turrets. Any damage/mulfunction could put half an artillery out of action. 6 guns was not ideal from artillery point of view. That design was done more or less on the same time as H3 series. It was other way to keep size of I3 down. This time by reduction of gun caliber, to middle from all considered guns, so 16.5” C45, with comment that if 16.5” caliber will be disliked for what ever reason, switch to 6x18” guns ( in twin turrets ) will be quite easy with little work ( on design stage of course ). With 6 guns armament will be the same as in H3, but in more turrets, so any damage/mulfunction will result with loss of less guns. Compared to H3, citadel over magazines of G3 was longer by significant numbers. Whole hull more or less the same as largest H3b, displacement even larger, so speed a bit lower ( “only” 33 knots ). Protection over magazines had priority. Machinery the same, hull too, artillery was ~1300 ton heavier than in H3. Some savings were needed. It was in deck protection over machinery. Flat section 5” thick and slope 3” thick was clearly too low to stop 15” shell at long distance. 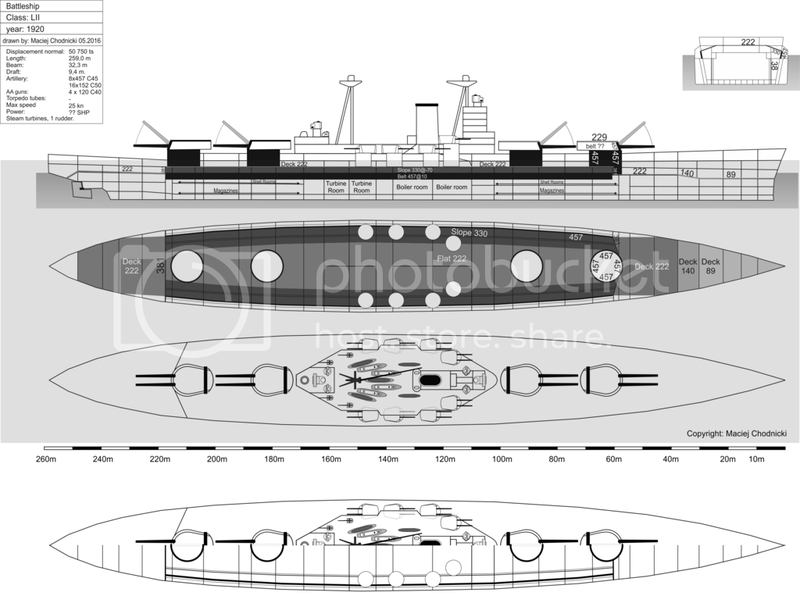 That design was presented to Admiralty with H3 series, so “their lordships” could choose what option they prefer – more smaller guns or less larger. They prefer G3. It was chosen for detailed work, but needed a lot of modifications. Those will be described later, after short switch to battleships. M3 was done first, more or less the same time as I3 ( longest of battlecruisers, first with new arrangement of artillery ). Ship was to be powered by only two shafts, due to weight savings. 56 000 SHP was quite possible on only two shafts. It was much less than half of power of I3. For British it was important to have possibility of maneuver with shafts only. To gain it, shafts had to be as far from center of ship as possible. So turbines were moved forward of the boilers. Boiler rooms become narrow, and shafts were closer to belts. So it gives more thrust momentum, so improved maneuverability. And moved funnel away from bridge. 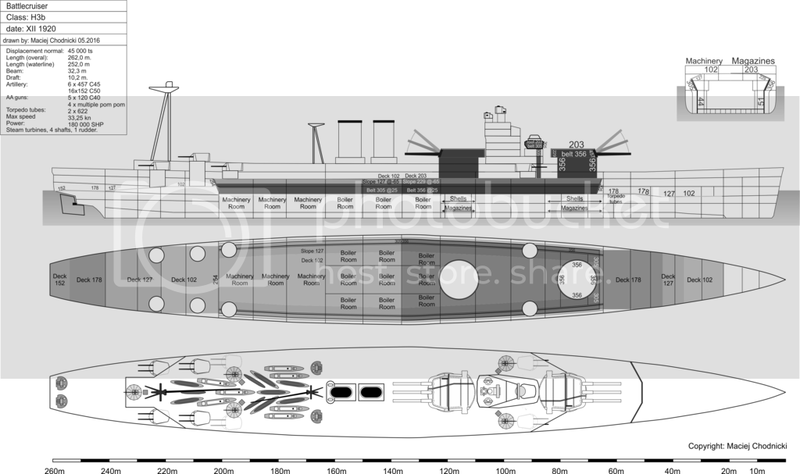 Whole things resulted in much shorter and over 5000 tons lighter ship compared to previous battleship L3 with conventional arrangement of turrets. Ship was 2 knots slower than L3, so not all savings was thanks to different arrangement, but most of them. Ship was promising. But there were still pressure for artillery in 4 twin turrets. So one month later ( more or less the same time as H3 and first G3 was done ), M2 with twin turrets were prepared. 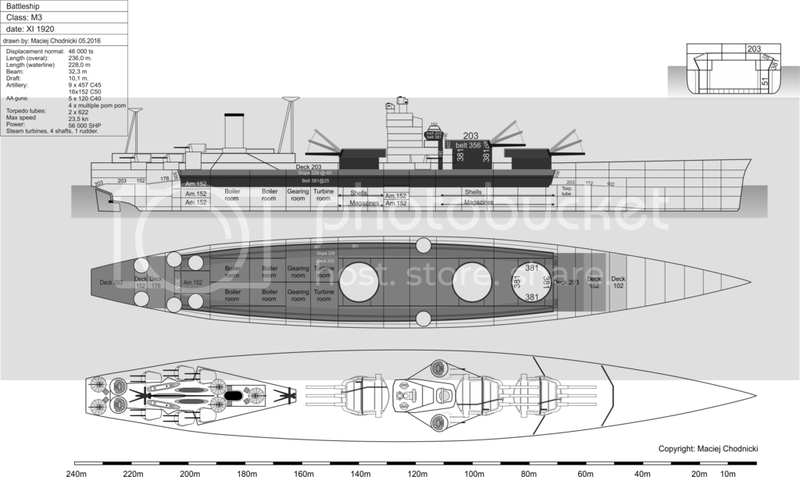 Basically it was the same ship with more length to give space for one extra turret. As a result ship become 2 750 ton heavier. And gained nothing except artillery in twin turrets. So M3 was chosen for realization. M2 was never seriously considered for construction. Decision to use triple turrets was done before it was prepared. It was just exercise to check chow much larger would be ship with “better” artillery arrangement. Difference in displacement was too large to be accepted. But that time more important was battlecuriser design, so work switch to upgrading G3, as preliminary had more than one flaw. G3 was promising, but needed many modifications. 1. Disposition of secondary guns. Numbers of guns were OK, but disposition far from perfect. Forward 6” turrets were OK, but rest not. They were too close, and all 3 of one site could be put out of action by one (un)lucky hit. More important – they were put under the deck. Deck was needed for space for boats and other equipment. But it was fear, that if could collapse, when hit, and block turrets under. Upper part of belt armour was ~3-4 feet inside hull. And stepped 25 degrees. It moved torpedo bulkhead far away from external plate. It gives extra protection, both torpedo and shell, but there were fear of stability. What good is to have intact citadel, if ship will capsize? So armour was a bit more vertical. Still inclined, but now 18 degree, not 25. The same time forward and aft bulkheads become vertical. In all previous designs were inclined 25 degrees. Thickness were retained the same, so protection was some way lower. 4. Small alternation of deck armour over magazines. All were 425 tons of savings. Rest 700 could not be compensated that way, so rising of displacement was accepted. Deck over machinery was still only 3” thick. It was thickened to 4”. Somewhere that time ( I don’t know exact when ) slopes of deck armour was removed, and deck placed just over belt amour, but with small slope – say 2 degree from centerline to belt. Max power was removed from 180 000 SHP to 160 000 SHP, interesting that original 18 boilers were switched to 20 new, but smaller ones. Alternation of after part of the hull – to gain room for gearings – resulted increase in resistance. Later again improved, but still resistance was a bit larger in final design compared to original. Mass was still increasing, so as weight savings, main guns were reduced from 16.5 to 16”. Original height of belt was restored. As a result, ship become 3 meters shorter, but displacement reach 48 000 tons. In 1921 for short time, restoration of power to original 180 000 SHP was considered, but ruled out. Expected increase of displacement was 200 tons, more important length by 8 meters ( 24 feet ). With such a length there will be problems with docking in Porthsmouth. Machinery spaces had to be widened. Total beam of ship could not be increased, as it was at the limit of translate through Panama canal, so torpedo protection will be compromised. Expected extra cost was 350 000 pounds. And running cost will be more due to higher burning rate, and need of some extra crew. Expected increase of speed by 0.5 knots was considered not worth all those costs. At first max speed 31-32 knots was considered too low, as it was 1-2 knots lower than Lexingtons, but soon that fear was ruled out. G3 was so much better armoured that this 1-2 knots difference should not be a problem. Belt was internal and inclined 18 degree. Upper part was 4 feet inside hull. In normal displacement ~1.4 meter was under waterline, and 3 meters over. Over magazines 14”, over machinery 12”. Forward boiler room had 14”. Magazines had to be protected against racing fire. Over machinery more complicated. Forward boiler room 8”, than next boiler room 6”, rest, and turbines 4”. After magazines, and half of after turbines 7” deck ( racked fire ). Aft of the citadel was deck armour more or less on waterline. Forward only over torpedo rooms. 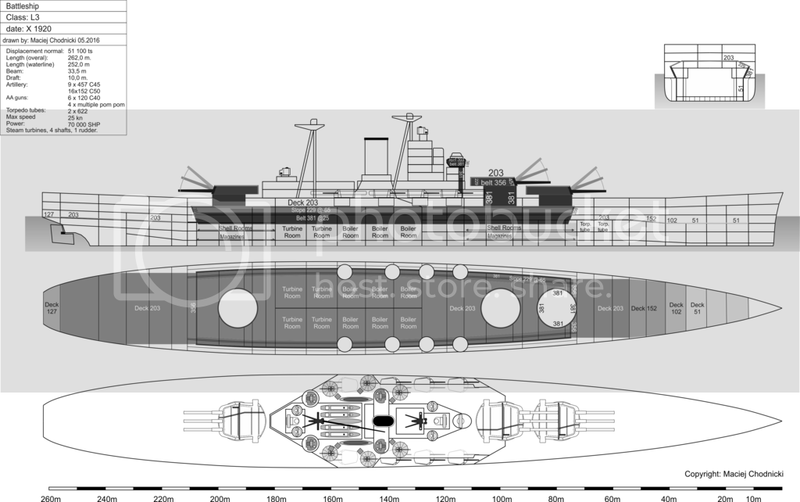 Lack of deck armour forward was considered flaw by British, but there were no other choice due to weight restrictions ( for Americans it was not a problem, they do not use that armour, Japanese on Yamato did not use either ). Designed to protect against 750 lbs of TNT. More or less on waterline there were crushing tubes. It was expected that they will give some stability in riddled condition, and possibly could decapp come shells. SPS to work needed over 2000 tons of water to be in place. Special system of blowing out that water by compressed air ( similar to that used in submarines ) was designed, to allow quick restoration to even keel in case of asymetrical damage. Double bottom was 7 feet ( 2 meters ) high under magazines and boilers, 5 feet on rest. Turrets ordered for first 2 were reordered for Nelsons, but were extensively modified compared to original design. They become lighter, put on smaller barbettes, and fire/flash protection was increased. It resulted those initial problems. AA guns as in AA committee recommendation. Cost for hull and machinery. Artillery, armour and fire control were ordered, and paid separately. Not single one was laid down when WNT was signed and all program scrapped. But ~0.5 million was spend for various tests, designs, weapons systems and so one. What could be used, was used on Nelsons. All modifications incorporated to G3, were included to battleship design. Instead of adding something to M3 point after point, all was included, and new design was named N3. Some things were not set when program was canceled. Numbers of boilers for example was not decided, nor exact configuration of protection of funnel uptakes and air intakes. It was time to decide it later, before ships were ordered. Basically compared to M3. 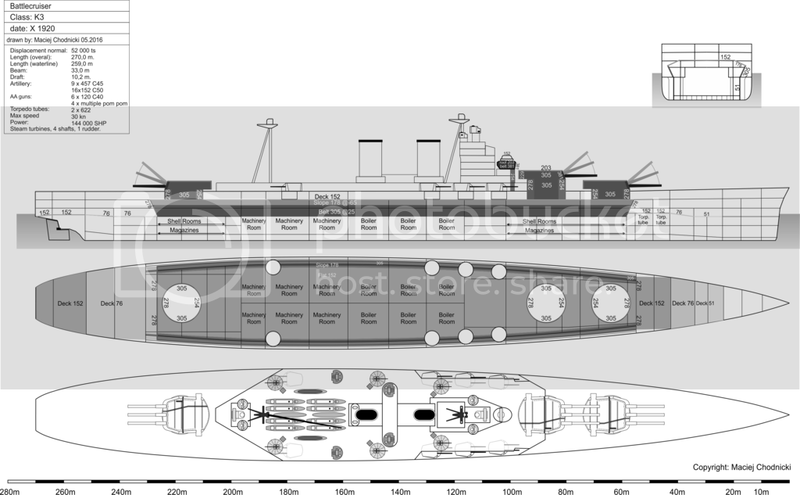 Sloped were omitted, sec guns rearranged, ship lengthened ( to reduce resistance, so power of machinery could be lower ). Configuration of machinery with turbines forward of boilers were retained. That time all was canceled due to WNT. 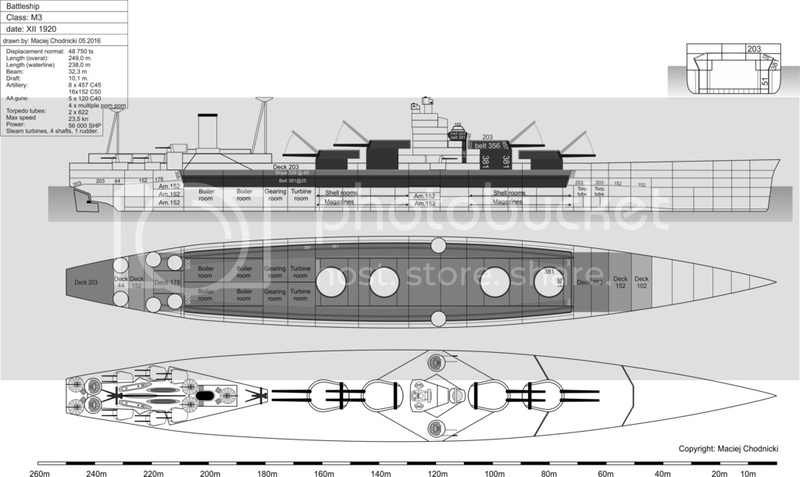 Friedman in it’s “British battleships” put some info about O3 – some improved N3 with a bit better armour, and more displacement. I don’t remember details, but how serious that design was, is visible, as name O3 was attached to one of preliminaries of Nelson. Much different and smaller design. I hope You ejoed it and found interesting. Interesting idea of using compressed air to blow water out of the SPS. Submarines can do that because the bottom of the tanks are open to the sea. Would that be the case here? What would be the source of the air? Surely not hundreds of compressed air tanks. Unfortunately I don’t know detail. Information about blowing tanks come from one of secondary sources. Possibly Raven & Roberts or Campbell ( I can check it next week, I’m far from my printed books now, only electronic versions are with me ). There are shipyards plans in existence in one of the British Museums. But copy cost some like 150 Ł, so a bit too much for me. Possibly in the future…. I remember some sentence that in Nelson, for weight savings, blow tanks were replaced by more powerful pumps. So compress air tanks? Who knows? All they stated is "air compressed system similar to that in submarine". So who knows? Tanks? Air compressed in real time?